I will setup a new collar trade with these assets. I can repurchase more AAPL stock (a lower number of shares now that I have to buy around 117), but I will be able to have a very value at risk. Earnings is coming up, which means there COULD me a large move in the stock -- either upwards or downwards. This is the event catalyst for the week. There is a also a dividend payment coming up in early November, so I also want to make sure I am the owner on record prior to the stock's ex-div date. This date should be early in November. Assume an opening price on Monday of 116.60, 74 200 will buy up to 636 shares. Add to the existing 10 shares and that will be a total of 646 shares. With 646 shares I will elect to hedge 600 shares and leave the 46 out. That is still 93% of the shares protected. 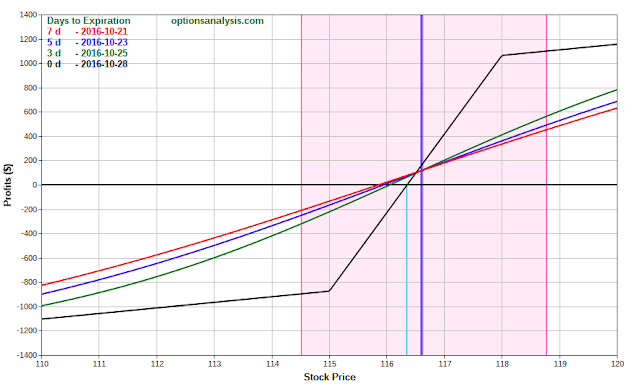 Option contracts hedge in multiples of 100 shares. What are the possibilities for the hedge? - Don't sell any calls, wait until after the event. Selling calls now can cap the upside should the stock jump significantly higher. What is done here depends on the tolerance for risk and expectations of the stock. 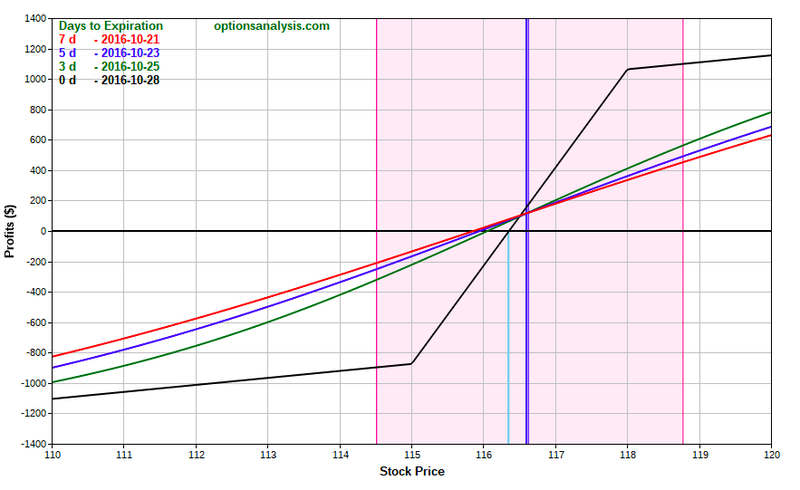 Options are expensive (implied volatility) this week due to the earnings. A large move is possible, but not guaranteed. The ATM options for this week's expiration are indicating about a 3.00pt in the price either way. A range from 113-119. I am going to use this as my guide. The net risk on position is minimal compared to its value. A large downside move and the position will drop around $800 to $1000. A large upside move will limits gains to around $1100. What ever the move, there is either an opportunity to trade the hedge to acquire more shares, or take it to expiration just 5d away and collect maximum profit. At the market open, AAPL was just over $117/share. I was able to roll up slightly and purchase the collar at higher strikes. The residual shares purchased were down slightly from 36 to 31 due to the higher stock price. I want to keep the cash comitted as close as possible without having to add significant amount to it. The original amount of cash available was 74,200. A difference of $180. 641 shares AAPL, 6 Oct 28 116 puts, 6 Oct 28 119 Calls. Note that the cost of the protective collar cost is a debit of 0.08/c as opposed to the planned credit of 0.07/c. This is due to the movement of the stock. 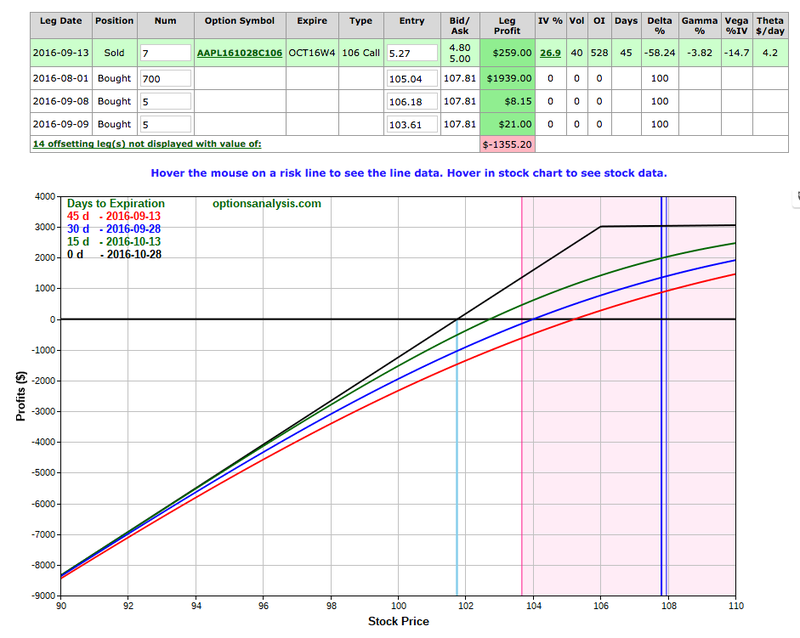 Here is the model payoff diagram with 4d to expiration. Notice that actual risk in the position for the expected move (pink bands) is less than $900. If the stock just moves slightly higher, the position makes just over $1100. All this will be determined in the next 4d. AAPL is reporting earnings on Oct 25 after the market closes. AAPL had a strong 4-day move in Sep and the stock is stubbornly sitting around 117. This is far away from the Oct 28th expiration 106 short call strike. This short call is now deep in the money. There is no way to roll the short call up to capture more profit without looking at a far out in time option well in to 2017. Anticipating another move in the stock at some point, I want to be the position to trade the hedge -- not just wait out more time decay and capping further potential profit with the short call. With that in mind, I am making an adjustment for the Oct 21 Friday expiration cycle. I will be buying back the short 106 call for Oct 28th, and rolling it BACK to Oct 21 causing the stock position to be assigned on market close on Friday. This is going to incur a very slight debit, but one I will hope to get back once the collar is re-established on the Monday morning. This trade gives up about $120 in profits ($18 X 7) for the chance to reset the hedge on Monday BEFORE earnings comes on the 25th. Because I have waited until 14d to expiration for the original option, these deep in the money options have nearly no time value. At the close on Friday, 700 shares of stock will be sold at 106/share. 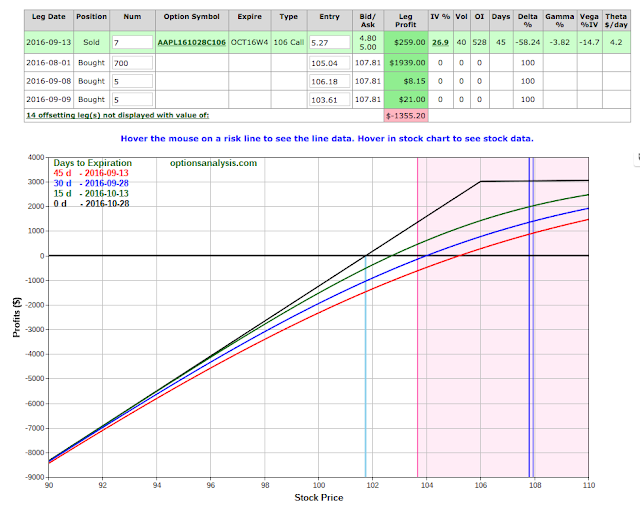 The account is left long 10 shares of AAPL with a net profit of just under $3K. I will have $74,200 in cash to purchase more stock and either construct a married put position or a full collar. Notice part of the position is sitting with a credit of $1830 -- much of this value is the 10 shares purchased from trading the hedge earlier in Aug/Sep. I am going to mark this trade closed and will reopen a new trade on Monday, carrying forward the shares and cash balance in a new position. AAPL is one of the the stocks up in otherwise down market. AAPL is currently moving up in the 108 pt range. This is a significant move off last Friday's lows of 102. Significant buyers are creating demand for shares. I am going to move the short call strike up and out in time to build a little more profit buffer. This is adding a few more weeks in time (45 DTE) but improves the profit potential to +$3K anywhere above 106pts. When I look at the price chart, there is still significant supply in the $110-$112 region on the daily and weekly. Price can possibly test this area but more buying will be needed to move past this level. The next catalyst will be earning release sometime in the Oct. Typically the fall is an overall bullish time for AAPL and tech in general. 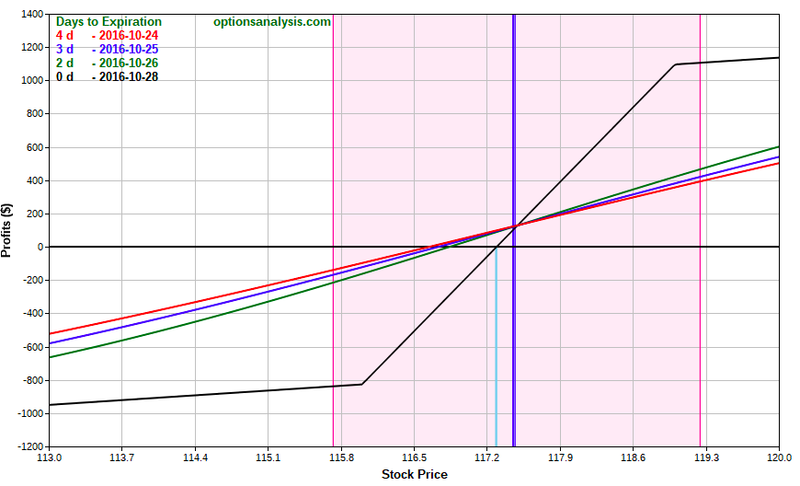 The position is now quite well hedged with -58 delta for every 100 delta in long stock and the max profit range is anything above 106 pts for the next 45 days.